My name is Kate Gardiner and I recently joined the Illinois Water Resources Center (IWRC) as a part-time communications coordinator. Prior to starting at IWRC, I interned at the Institute for Sustainability, Energy, and Environment and earned my B.S. from the University of Illinois in environmental sustainability. Since sustainability can be so widely applied, the University of Illinois now incorporates lessons in sustainability into a multitude of courses in different fields spanning from business to architecture. 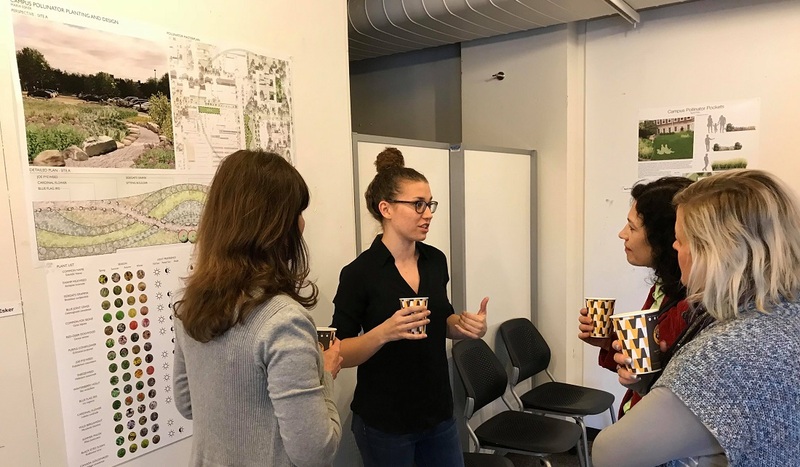 Recently, I had the opportunity to join Eliana Brown, outreach specialist and rain garden expert with IWRC, to visit a landscape architecture class and provide feedback for the students’ final design review. One of the key objectives of Landscape Architecture (LA) 452, led by Katherine Kraszewska, is to teach students to identify and incorporate native plant species when envisioning a new landscape. This is a win-win, as the native plants attract pollinators and, when used in rain gardens, can improve downstream water quality. For their designs, students were instructed to increase connectivity between pollinator pockets and consider stormwater management. Pollinator pockets are spaces with native plants, serving as an oasis for butterflies, bees, hummingbirds, and other pollinators traveling through the area. Pollinator pockets are scattered throughout the U of I campus, including the Facilities & Services’ low mow zones and the Master Gardener Idea Garden. We spoke with several students about their designs, here are some of our favorites! Landscape architecture senior Layne Knoche designed a sunken courtyard by the Allen Hall dormitory. His plan included a small grass lawn, native plantings that attract pollinators, and a patio for students to sit and enjoy nature. He chose his plantings based on seasonality, moisture tolerance, plant heights, and what pollinators they attract so that the garden could be beautiful all year round as well as attract different species. Maria Esker, also a landscape architecture senior, designed an interactive campus rain garden. It included a path through the garden, large boulders along the path for sitting, and a wide range of native plantings for people to enjoy year round. Her rain garden would catch excess runoff from the adjacent parking lot and be a relief for pollinators traveling through campus. Eliana shared with the students that they did a great job integrating concepts they learned in the rainscaping course into their final designs. This wasn’t the first time she visited the class—Eliana previously shared her expertise in a stormwater rainscaping guest lecture (along with Extension Educator Jason Haupt). 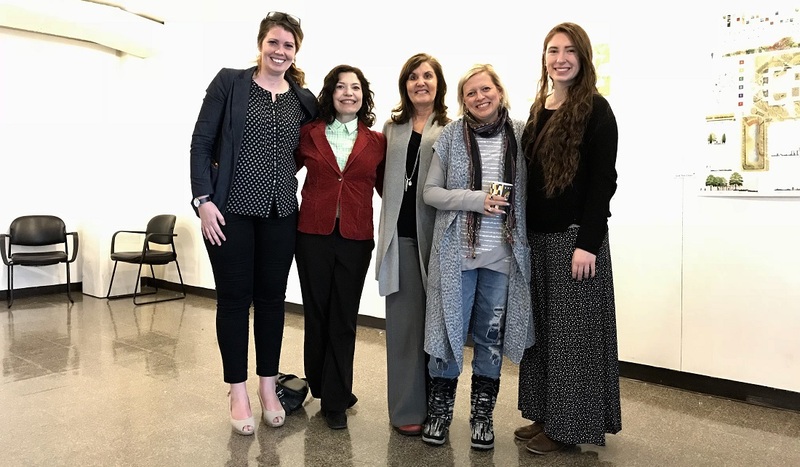 These bright students all had innovative and sustainably-inspired designs, greatly due to the teachings and encouragement from their professor as well as their own creativity. While reviewing their designs, we learned that many of the students in the class are graduating this year. As they move on from the university and start their careers, I wish them luck and hope they take what they’ve learned in LA 452 with them and apply it to their future designs.